Cenon can be used to convert quite a number of vector graphic formats in any desired direction. 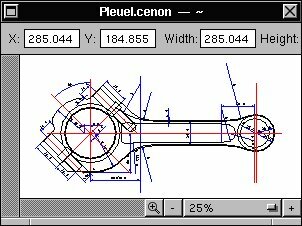 Cenon also allows editing of the data. 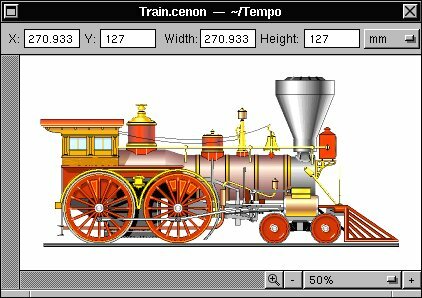 The import of Cenon is used to read the graphics file. The format is automatically recognized by the file extension. After the file is imported, it is fully editable like any other Cenon document. The export allows writing to any of the supported file formats. Cenon works hand in hand with the well known GhostScript interpreter or the Display PostScript of your system. Also PDF is read using the GhostScript interpreter. Cenon exports EPS or PS data. The generated EPS data of Cenon is a straight and simple PostScript without tricks, and should be readable by any other program. The Adobe Illustrator format can be imported using the PostScript prologues from Adobe. This procedure could be extended to other formats, which are similar to the PostScript format. The DXF import allows import of two dimensional data. The extention towards 3-D is planned. On export of DXF, simple and straight forward data is written, which should be readable anywhere. 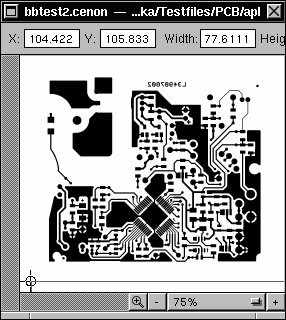 The Gerber format is widely used in the area of electronics in the production of printed circuit boards (PCB). Cenon imports the older Gerber format as well as the newer Extended Gerber (RS274X), which supports complex polygons. Cenon always writes Extended Gerber files. 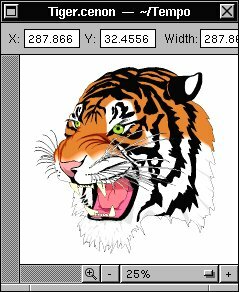 With Cenon, you can import SVG graphics. Cenon allows the import of HPGL derivates. Configuration files allow the configuration of different file formats for import as well as for export. Cenon reads and writes derivates of the DIN data format. Examples are Sieb&Meyer, Wessel and Excellon. So far, the import is limited to drill markings. Even Type-1 fonts can be imported and exported with Cenon. This function turns Cenon into a font editor. All our CAM Fonts (engraving fonts) were created with Cenon. All mentioned trade marks are the property of their respective owners.